The second of two engine burns meant to put NASA's Jupiter-bound Juno probe on course for a speed-boosting Earth flyby next year has been pushed to Sept. 14, officials announced Tuesday (Sept. 4). The burn was originally scheduled for Tuesday, but the mission team delayed it by 10 days after analyzing the results of the Juno spacecraft's previous engine firing, which took place Aug. 30. The Aug. 30 engine burn worked well, changing Juno's velocity by 770 mph (1,240 kph) as planned. However, the 30-minute maneuver also caused propellant pressure in the spacecraft's propulsion system to rise higher than expected, researchers said. "The team has decided to take an extra 10 days to analyze this increase and consider mitigation options, placing the second deep space maneuver on Sept. 14," NASA officials wrote in a mission update on Tuesday. "There will be no impact to the mission's timeline or science." The two deep space engine burns are designed to set Juno up for a close flyby of Earth on Oct. 9, 2013, which will bring the probe to within 310 miles (500 kilometers) of our planet. If all goes as planned, Earth's gravity will slingshot Juno toward Jupiter, boosting the probe's speed by 16,330 mph (26,280 kph), researchers said. The $1.1 billion Juno mission launched on Aug. 5, 2011 and is scheduled to arrive at the solar system's largest planet on July 4, 2016. Juno will orbit Jupiter for about a year, using eight science instruments to peer beneath the thick Jovian clouds. Juno's main goal is to learn about Jupiter's atmosphere, magnetosphere, composition and origins, and to determine if the planet has a solid core. Learning about the formation of Jupiter — which snapped up most of the material left over after the sun's formation — can teach us a lot about the history of Earth and the solar system in general, scientists have said. The Juno probe weighs about 8,000 pounds (3,267 kilograms) and draws its energy from the sun. 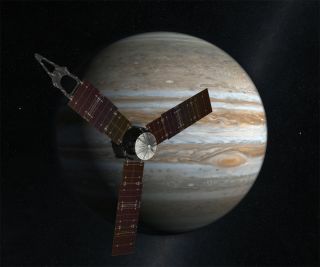 The mission marks the first time a solar-powered probe has ventured as far out into the solar system as Jupiter.